Free Shipping Included! Kaiser 205554 RB 104 Copy Light Set with Four Reflectors by Kaiser Fototechnik at Marco Marcucci. SKU: 759563. MPN: 205554. Hurry! Limited time offer. Offer valid only while supplies last. The Kaiser RB 104 Copy Light Set with four reflectors is for use with photoflood lamps up to 250 watts each. Lights can be switched separately. 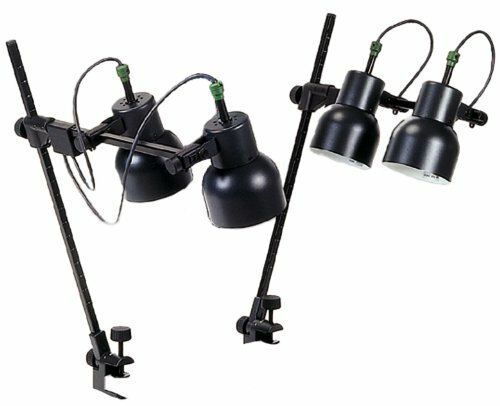 The Kaiser RB 104 Copy Light Set with four reflectors is for use with photoflood lamps up to 250 watts each. Lights can be switched separately. Lights can be tilted and shifted. Horizontal lamp arms can be adjusted continuously in height. Vertical lamp arms with height markings, tiltable 72 degrees from vertical with detents. Mounted with strong die-cast clamp bases to baseboards up to 1.9-inches thick. Supplied without lamps. If you have any questions about this product by Kaiser Fototechnik, contact us by completing and submitting the form below. If you are looking for a specif part number, please include it with your message.